I’ve always been interested in work which falls slightly outside of what is regarded as fine art. Initially in my early teens this came through my interest in music and the covers of records. 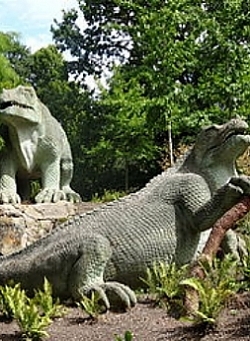 The first public sculptures that come to my mind, which I love, are the Crystal Palace Dinosaurs, which form part of a group with other extinct animals in concrete. What could be more perfect than concrete – a material that itself has a finite lifespan? First unveiled to the public in 1854, as depictions of dinosaurs they are not at all correct by modern standards, but in my opinion they are all the better for not being so. An evolutionary lesson in material and subject, as understanding and knowledge increases, the past becomes malleable, even in concrete. There are many sculptures, artworks and buildings, both public and private, that I think should be considered for removal or at least covered with a large reflective tarpaulin that somehow renders them invisible! As there are so many it seems almost unfair to single one out, but the first that comes to mind is Anish Kapoor’s ArcelorMittal Orbit in the Olympic Park. I have to see it every Tuesday when I take my son to his swimming class. It makes me wish for another exit from the swimming pool. Peter Liversidge is currently featuring in ‘We The People Are The Work’ at Plymouth, 22 September-18 November 2017, and has a solo show ‘AS SCULPTURE’ at CGP, The Gallery, Dilston Grove, London, 28 September-29 October 2017.